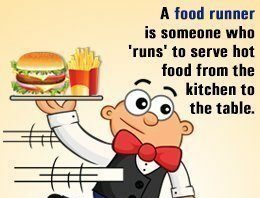 A waiter’s or waitress’s job is not very easy. In fact there are some challenging parts associated with their job. 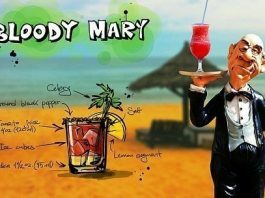 Many waiter or servers, who take order and serve guests daily in restaurants, often try to find out what is the best possible way to clear the guest table after the meal. 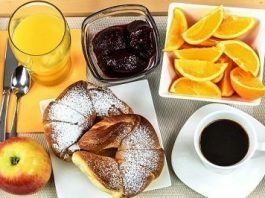 In this tutorial, we are going to share some amazing tips for food servers to give an good overview on how to clear and check the guest’s table after service and prepare for billing in polite and timely manner without interrupting the guest’s experience. Guest has finished his meal and there is no food left on the plate. Guest has put the knife and fork in the middle of empty plate. Customer hasn’t touched the food for more than 15 minutes. These may be some ways to calculate the best time for clearing guest table but double check all other facts before approaching a guest. 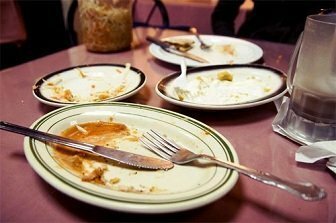 Often in a fine dinning restaurant, if 3 people are having food and one has finished earlier then if a waiter approaches to clear his plate other guests may feel offended and take it as a sign of rush out. Be attentive to guest’s sign and respond to tables even it is not your station. Keep your head always upright, look around. Approach the table only when all guests have finished their meal. Keeping the cutlery inside is an indication of completion of meal. Clear plates from the right hand side of the guest, ladies first at all times following by an old guest or guest and the host last. While clearing table, try not to make too much sound. 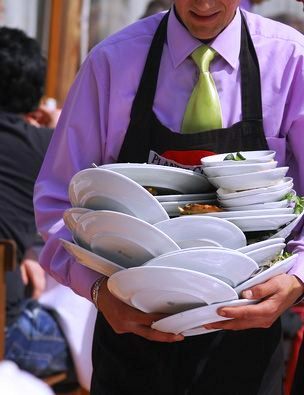 Clear the table quickly but with efficiency without disturbing the guests and clear the table by saying with a smile: “Excuse me Mr. X, may I clear your plates”. If the guest is pleased with the food, say: “Thank you”. 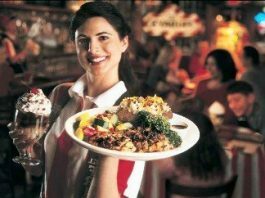 If the guest is not pleased, apologize at once, thank him / her to inform you, exchange the dish and inform the restaurant manager. 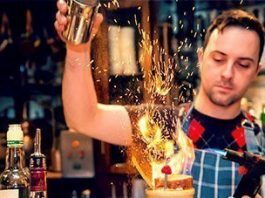 Do not take more than 5 minutes between clearing one course and serving the next course. Serving and clearing station quantities should be pertinent to the Restaurant volume and capacity. Never keep the trays on the guest table to clear dishes. Though keeping the cutlery on the plate is commonly used as an indication that the customer has finished the meal, however always check with the guest to confirm before clearing the table. All staff members should be knowledgeable about the cutlery positions (indication of completion of meal). For example: horizontally across the plate at 3.00 o’clock or vertically at 6.00 o’clock. Remove bread and butter setting only when the main course has finished. Present the check if the guest requests. 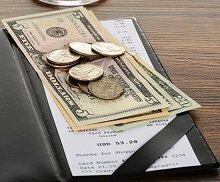 Check to ensure the bill or the check is accurate, properly itemized, clean, no stains or marks before presenting it to guest. If there are any promotional materials make sure that they are clean and updated. Bill should properly specify what is included in the charges (ex- tax cover charge, service charge). Give sufficient time to the guest to check and settle the bill without moving around the table, but stay in surrounding area. Recover check and method of payment (if appropriate). Thank the guest and perform accordingly and quickly. 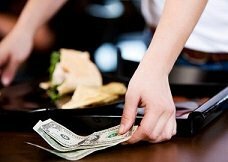 Make sure that the cashier deals with the check quickly and returns the change or customer credit immediately (if any). Give a copy of the receipt to the guest with the card (if the method of payment is credit card) in a folder by saying: “Here’s your card and receipt, Mr. X, thank you very much”. If the guest disagrees with the bill, say: “Please give me a moment to look into this” Do not check the bill in front of the guest. Sign discrepancies within a certain limit as set by management. Apologize to the guest for any real perceived errors. Place the tooth picks immediately right after the clearance of main course or when food plates have been finished. Put the toothpick holder on a tea saucer properly. Approach the table and keep on the center of the table to make it easily available to the guests who are sitting on the table. Check to ensure that all toothpicks holder are clean, free of stain and are in correct order. Clean and wash the tooth pick holder at least twice a week and replace the toothpicks in the holder once in a weak. Fill the toothpick holder up to a standard level; do not over fill the toothpick holder. Remember that placing toothpicks are only served after the main course. If the guest opts only for a soup, salad and dessert then placing toothpick could be made upon request. 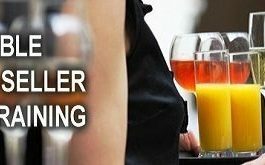 Dear audience, now a days we are developing exclusive hotel management training videos. We are producing new training videos twice or thrice in a week. So if you don’t like to take any chance to miss any single tutorial, you should visit our YouTube Channel and click on Subscribe link so that whenever we would upload new videos, you will get automatic notification in your email. Click HERE and watch our videos. DON’T MISS THIS LEARNING OPPORTUNITY.